In 2016-17, the live music programme welcomed 27 professional musicians into 74 locations in wards, clinics, waiting areas and Brunel atrium at Southmead and Cossham hospitals, directly engaging a total of 652 patients and 320 staff at Southmead, 288 patients and 95 staff at Cossham as well as thousands of passers-by in the atrium! 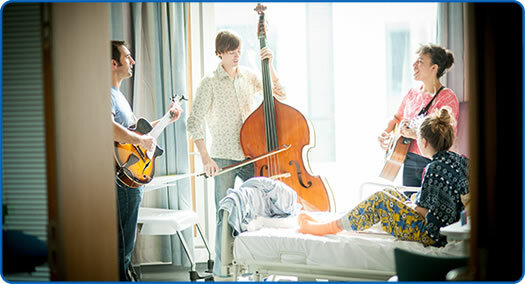 Live music entertains our patients and staff, provides a wonderful talking point and brings a relaxed atmosphere to the hospital. Music helps to create a positive healing environment to support the recovery process and also boosts wellbeing by decreasing levels of stress, anxiety and depression – essential in a busy hospital like ours. With funding from Southmead Hospital Charity and the donations people make to our programme, we work with national music agency Superact to bring professional musicians to wards, waiting areas and clinics for two afternoons every month. On Ward 8B: a patient comes out of her room to hear Ben Huws play and her daughter, genuinely pleased, says: "This is wonderful, it's the first time my mother's been out of her room in two weeks!" Research shows that music makes a huge difference to the recovery of and outcomes for patients, reducing their length of stay in hospital and enlivening what can be an intimidating and frightening clinical atmosphere. Engaging staff in music activities has been shown to contribute to increased job satisfaction as well as enhancing the quality of the service offered. As well as taking professional musicians on to the wards and into the Intensive Care Unit, we have a grand piano in our atrium. This is played by a wonderful range of musicians who volunteer their time and talent to bring music to everyone in the hospital. Did you know? In 2016 our volunteer pianists provided an enormous 753.5 hours of music on our Fresh Arts grand piano for patients and visitors at Southmead Hospital, Bristol. This is just wonderful, especially if you're not in a good headspace. Please tell them I really enjoyed it, she has such a great voice. It’s the best thing that could have happened to us this afternoon; it’s been a really stressful day. I had a brilliant time. The music was great and we really enjoyed it. You are always very welcome here – I didn't want it to end. He's a fab guy!